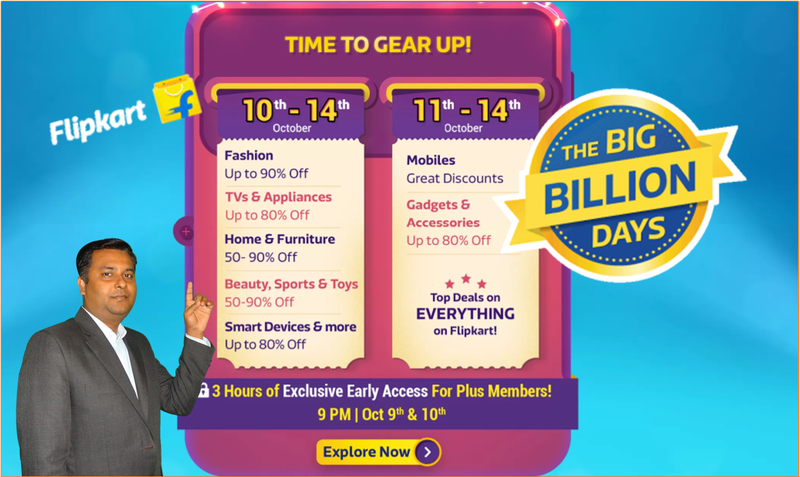 Flipkart The Big Billion Days Sale (TBBD 2018) starting from 10th Oct to 14th 2018 with the special discount, offers and deals on all the segments i.e. Electronics, Home Decore, Fashion, Mobile and more. Also on This Flipkart The Big Billion Days Sale (TBBD), Flipkart giving special discount on new Mobile Phone launches, deep discounts across all categories, huge price drops as well as 10% instant discount with HDFC cards & EMI transaction. Flipkart making the best of the major events planned this month with deep discounts & deals/offers on this Big Billion Days Sale 2018 (TBBD 2018) and promoting TBBD 2018 events with the slogan “Ab India Hoga Budget se Mukt”. Here I am going to share great deals with you so that you may have a look and see the offers & compare the rates if you want to make a benefit/profit from this Big Billion Days Sale 2018. So whichever deals attract you visit the offers and see the features of the mobile and get the benefits of this Flipkart Big Billion Days Sale 2018. So Grab these deals on Tvs and appliances on this Flipkart Big Billion Days Sale 2018. You may also search Flipkart products here too. For further more information on Flipkart The Big Billion Days Sale 2018 (TBBD 2018) which is going to start from 10th October to 14th October can be seen in this video. Let us know about this article “Flipkart The Big Billion Days Sale (TBBD 2018) | 10th Oct – 14th Oct Biggest Sale on Flipkart” and please comment your views and thoughts too. Also please do visit our youtube channel and subscribe our channel Sab Kuch Online for more informative video.